The first-time memoirist on grief, pets, and growing up. The Shoebox Funeral is not your typical YA book – it doesn’t feature a teenage love story or magical abilities, and there are no evil forces threatening the world. Instead, the new memoir from author Elisabeth Voltz does something much more unusual: it talks an awful lot about death. The book covers Voltz’s adolescent years on a farm in rural Grove City, Pennsylvania. Its primary subject matter is, literally, shoebox funerals, which should be heart-achingly familiar to anyone who grew up with pets: it refers to that ritual of burying a beloved dead pet. Voltz did this not once but dozens and dozens of time: she grew attached to both strays and the dying, unwanted pets that townspeople would drop off at their farm (if your parents ever gave you that whole Spike-went-to-live-on-a-farm runaround, well: Voltz lived on that farm). Although Shoebox Funeral also covers more traditional coming-of-age material, it’s the animals and their deaths that enforce the Big Lesson we all learn sooner or later: life is short, and death can’t be outrun. The book is written with a kind of wonder that should ring true to anyone who spent most of their childhood outside, but it’s often, as you can imagine, heartbreaking to read: Voltz faces her sorrow and grief directly, and through it we learn what she’s learned through a lifetime of loving every new animal that entered her life, no matter how short their stay. I corresponded with Voltz in October via email. Our conversation is below. How did it feel writing a book for a young adult audience that has death as one of its big subjects? Was it easier to do that with pets, or was it more difficult? Since there is an almost 20-year difference between me and my eldest sibling, all of my grandparents passed away before I can remember. So luckily, I did not have to learn about death by losing a grandparent, as many children first do. But I did have to deal with it frequently with my animals. I resisted writing this book for years because I didn’t want to open those wounds back up. I was nervous about what memories would resurface, unsure if I was ready to deal with them. I remember a point in my life, around high school, when I tried really hard to push the sadness of lost pets to the back of my head, or turn off my brain completely. I always told myself that when I felt stronger I would allow myself to remember them and continue to mourn, like my animal friends deserved. But I’m surprised at how many buried memories and details came rushing back once I sat down with my family and started discussing old pets. It was quite therapeutic, actually, for all of us to talk through all our recollections and realizing that each of us had actually many of the same feelings and experiences. Until then, I felt I was very alone. I was so wrapped up in tending to my favorite pets that I didn’t see my other nine siblings were also off with their own animal lost causes in other corners of the farm. 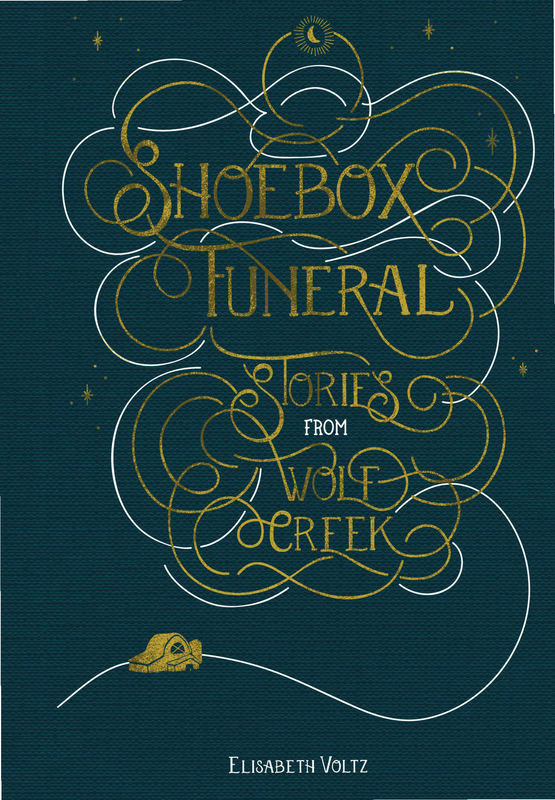 Shoebox Funeral: Stories from Wolf Creek, Elisabeth Voltz. Animal Media Group LLC, July 2017. 250 pp. You were influenced a lot by the animals you always had around – they were your best friends. How has that shaped you now, as an adult? Do you prefer the company of animals over humans? I feel more relaxed in the company of animals; it feels natural and right to have them around. Spending time with people, on the other hand, makes me feel overwhelmed quickly. Being one of the youngest in a large family, I got used to being quiet or disappearing in a crowd. I feel socially awkward with humans, but around animals, I always seem to know my place. ShoeBox Funeral covers a lot of time: an entire childhood on a farm. How did you decide which stories to tell? Was the process of writing this book painful to relieve, or cathartic? I wrote so many memories down as they came back to me, but less than half of them actually made it into the book. Many of the stories that didn’t make it into the final manuscript were just too sad or brutal. My book editor and I felt it was necessary to keep a balance between the dark stories and the more hopeful ones. While I was sad to lose some stories, I know it was a good call; readers would have a hard time finishing the book. But I feel like there’s still a place for the stories that didn’t make the cut. I would love to use those in another book or in another platform soon, exploring my relationships with my siblings and parents, as well as their relationships with their pets. Your book reminded me in a lovely way of Caddie Woodlawn and Little House on the Prairie. What were your literary influences growing up? I also enjoyed reading Little House on the Prairie growing up. And Cheaper by the Dozen, since there were so many parallels between that large family and ours. But mostly, I enjoyed The Redwall series and The Lion Witch and the Wardrobe series; my sister would read to all of us at bedtime. Both were about kingdoms of animals and talking creatures, which I enjoyed thinking about very much. I believed our woods [behind the farm] were magical, and I imagined the secret adventures our pets and woodland creatures had. But the books that had the largest influence on me were our encyclopedias, or World Books. For many years, my siblings and I would lounge around on the floor together reading those encyclopedias like they were novels, trading volumes with each other from time to time. I can remember the pictures in those volumes vividly. When you're travelling or busy working and can't make it back to the farm, what's your go-to outlet to feel at home? I try to bring the farm to my city home any way that I can. Something doesn’t feel natural or right about being in spaces that don’t have living things, so every window in my home is crowded with plants, and the sounds of animals can be heard in every room – whether it’s my ferrets digging in a flower pot, or my dogs playing, or my finches singing. I pick flowers from my garden for my office because smelling them reminds me of the country, even though my office view is of downtown Pittsburgh. Anything else feels wrong.